Mae Koslow-Vogel, all of 14-months old, sits on the floor in blue jeans with a maraca in her small fist, her baby-tooth smile radiating through the room. The sun shines through a purple, butterfly-shaped balloon, casting playful patterns across a wall. And for a moment, you forget this is a hospital — until you see the trach and tube running from the little girl’s neck. Mae reaches out and strums the guitar of the music therapist sitting with her. Her smile grows wider as she realizes in delight that the notes she hears are her own. In her short life, Mae has only lived in hospitals, and she’s been a patient at Franciscan Children’s in Brighton, which specializes in care for children with complex medical conditions, for the past eight months. The one daily constant for her has been music. From the day she was born, Mae’s mothers, Courtney Koslow and Maura Vogel, used music as a way to communicate with her, to soothe her. By using music therapy, Franciscan made sure that throughout Mae’s journey to better health, through her ups and downs, the comfort of song was always there. “Throughout our relationship, we loved to go hear live music,” says Courtney. And, as they quickly learned, it soothes Mae. Mae was born with a genetic form of childhood interstitial lung disease called ABCA3, an extremely rare abnormality that comes with uncertainty; she may improve or possibly need a lung transplant. For now, she is able to breathe on her own for short periods but a trach and ventilator provide additional oxygen to her blood for her to live. For Courtney and Maura, each phase of Mae’s treatment has its own soundtrack. The lullabies played during Mae’s first days in the NICU, which have been shown to stabilize breathing and stress levels in infants, bring back tough memories. But now at Franciscan, music reminds them of happier times, like watching Mae jiggle and dance to Carly Rae Jepsen’s pop smash, “Call Me Maybe” in her sunlit room. 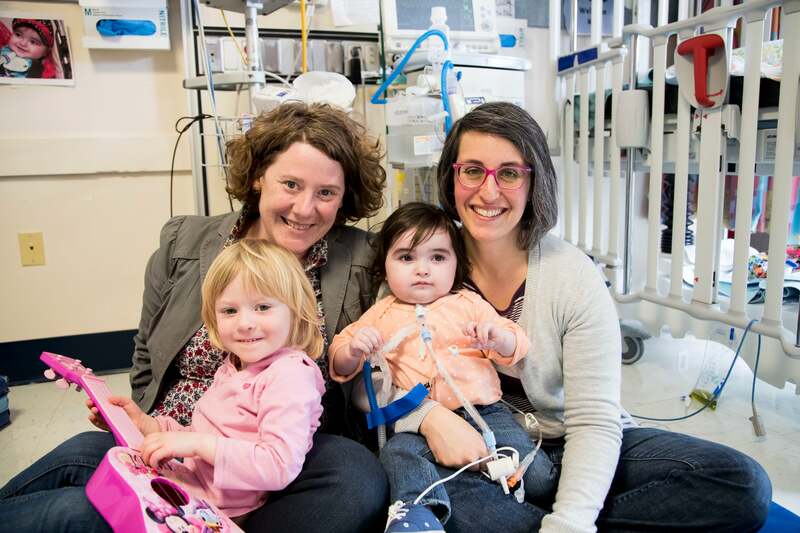 It was Mae’s care team at Franciscan who encouraged Courtney and Maura to use music therapy both as a way to connect with their daughter and to help her developmentally. And it’s a treatment that’s caught on nationally. According to the American Music Therapy Association, there are now 6,000 music therapists practicing in the U.S., 15 percent of whom work in medical or surgical settings. Music therapy has evolved from niche to mainstream and is quickly becoming a routine part of care at children’s hospitals, helping young patients with everything from anxiety and language development to cognitive and developmental behaviors. 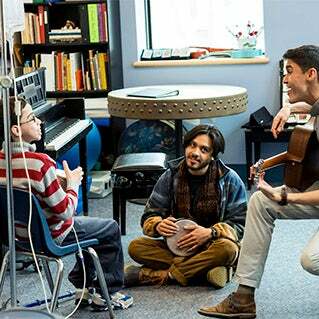 In this city, filled with rock, rap, classical, and jazz musicians, Franciscan Children’s uses music for more than listening pleasure. They’ve seen consistent clinical results from music therapy, accomplishing challenging treatment goals in patients like Mae. With her music therapist, Mae has learned interactive songs like “Head, Shoulders, Knees, and Toes” and “The Itsy Bitsy Spider,” developing the motor skills that will help her to use instruments and objects, from crayons to eating utensils, now and later in life. Krysta Warner, a senior music therapy student at Berklee College of Music, has been working with Mae this spring to encourage these skills, including language. In a song she wrote for Mae, Krysta describes her as “a tough cookie that was cooked just right,” using her name throughout the refrain to engage her more directly. While Mae’s trach makes singing aloud difficult, she shows off her signature dance moves at the first sound of music, bouncing along to the beat with her family and trying to vocalize the lyrics she hears. “Music helps to give us language so we can have a conversation with her while she’s not able to talk,” said Maura. The bonds that music has helped build within Mae’s family are especially visible when it comes to her two-year-old sister, Rosie. Rosie plays the DJ in Mae’s room, selecting songs from the family’s iPod so she can dance with Mae. The sisters have their favorites, helping them to connect without words, and you can often hear Rosie singing them as she walks through Franciscan Children’s front door on her way to visit Mae every Saturday. Those songs, those visits, and her regular music therapy sessions have all helped this bubbly 14-month-old girl overcome the intense separation anxiety that’s so common among children her age. This level of comfort comes standard at Franciscan, where children spend considerable time recovering after being treated by acute care hospitals. Franciscan’s care teams don’t just think about today, she explained, they prepare their young patients and their families for tomorrow, next month, and next year. “Being here at Franciscan where it’s so much more relaxed than the ICU settings we were used to has almost become a nice, familiar routine,” Courtney says. But it’s a routine she and Mae’s care team are excited to change. When Mae arrives home for the first time this summer, she’ll start a new routine with her moms and Rosie. She’ll receive care from an at-home nurse for 90 hours each week. And, importantly, Mae will still have her visits with a music therapist, giving her added support and activity while she’s unable to wander outside with her vent. Franciscan, meanwhile, is taking steps to prepare the family for this next chapter in Mae’s treatment, even writing and illustrating a book to help Rosie understand what this means for her and her sister. Mae might one day need a lung transplant — or she might not. But if it’s up to her family, Mae will never feel this uncertainty herself. She’ll hear only the soothing sounds of music from her own bedroom. And for Mae, finally, a nice change of tune. Listen to the full song Krysta wrote for Mae on SoundCloud. To learn more about children like Mae and the services that Franciscan Children’s provides, please visit franciscanchildrens.org. Sign up to learn more about Mae Koslow-Vogel's journey and get updates on her progress.